Thermotoga spp. are attractive candidates for producing biohydrogen, green chemicals, and thermostable enzymes. They may also serve as model systems for understanding life sustainability under hyperthermophilic conditions. A lack of genetic tools has hampered the investigation and application of these organisms. This study aims to develop a genetic transfer system for Thermotoga spp. Methods for preparing and handling Thermotoga solid cultures under aerobic conditions were optimized. A plating efficiency of ~50% was achieved when the bacterial cells were embedded in 0.3% Gelrite. A Thermotoga-E. coli shuttle vector pDH10 was constructed using pRQ7, a cryptic mini-plasmid found in T. sp. RQ7. 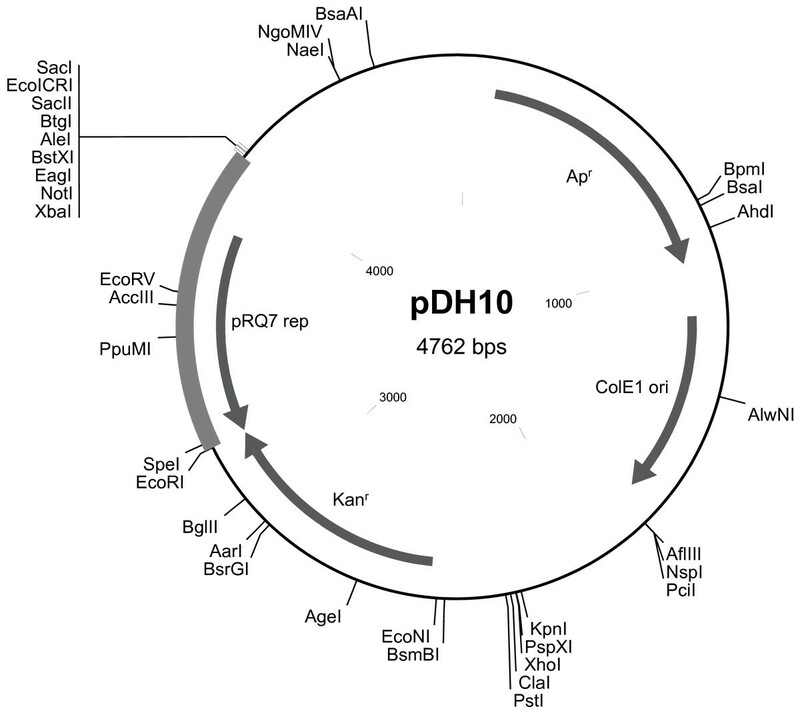 Plasmid pDH10 was introduced to T. maritima and T. sp. RQ7 by electroporation and liposome-mediated transformation. Transformants were isolated, and the transformed kanamycin resistance gene (kan) was detected from the plasmid DNA extracts of the recombinant strains by PCR and was confirmed by restriction digestions. The transformed DNA was stably maintained in both Thermotoga and E. coli even without the selective pressure. Thermotoga are transformable by multiple means. Recombinant Thermotoga strains have been isolated for the first time. A heterologous kan gene is functionally expressed and stably maintained in Thermotoga. Besides Aquifex, Thermotoga are the only group of bacteria that can grow up to 90°C. Isolates of Thermotoga have been discovered from heated sea floors , continental hot springs , and oil fields . Analysis of their 16S rRNA sequences have positioned Thermotoga spp. to a deep branch of the tree of life, suggesting that these strict anaerobes emerged at an early stage of evolution, when the surface of the Earth was hot and its atmosphere contained little oxygen. Study of the molecular genetics of Thermotoga is expected to shed light on the fundamental questions related to the origin of life as well as the mechanisms of the thermostability of macromolecules under extreme conditions. Most importantly, Thermotoga hydrolyze a number of polysaccharides through fermentative catabolism and produce hydrogen gas as one of the final products . This has stimulated tremendous interest in utilizing these bacteria to produce biomass-based clean energy, especially through metabolic engineering approaches. However, due to the lack of genetic tools, the investigations of Thermotoga are still largely limited to biochemical, genomic, and fermentative studies, as with most hyperthermophiles. Cryptic mini-plasmids pRQ7, pMC24, and pRKU1 have been identified in T. sp. RQ7 , T. maritima , and T. petrophila RKU-1 , respectively. Although discovered at geologically unrelated locations, the three plasmids are nearly identical. They are extremely small (846 bp) and encode just one apparent open reading frame, presumably the replication protein. Studies of pRQ7 suggest that the plasmid is negatively supercoiled and replicates by a rolling-circle mechanism [5, 8]. Based on pRQ7, two Thermotoga-E. coli shuttle vectors pJY1 (chloramphenicol-resistant) and pJY2 (kanamycin-resistant) have been constructed for expression in T. neapolitana and T. maritima, respectively . Through liposome-mediated transformation, both vectors rendered transient antibiotic resistance to Thermotoga cells in liquid media, but no transformants could be isolated from plates. To date, that report remains the only documented effort of expressing heterologous genes in Thermotoga, out of more than 1200 publications retrieved from PubMed using "Thermotoga" as the key word (last searched December 20, 2011). In fact, genetic manipulation of Thermotoga remains a challenge. To develop a tractable gene transfer system for Thermotoga spp., we systematically examined every aspect pertaining to the cloning and expression of foreign genes in Thermotoga, from plating efficiency to vector stability. We demonstrate that heterologous genes can be introduced to Thermotoga through multiple means, be functionally expressed, and be stably maintained. Bacterial strains and vectors involved in this study are listed in Table 1. E. coli DH5α was used as the host strain for the construction of vectors and was grown at 37°C in Luria Broth (1% tryptone, 0.5% NaCl, 0.5% yeast extract), with 1.5% agar for plates. Ampicillin was supplemented at 100 μg ml-1 when needed. Thermotoga neapolitana ATCC 49049 (same as T. neapolitana DSM 4359) was purchased from ATCC http://www.atcc.org/, and strains T. sp. RQ7 and T. maritima MSB8 were kindly provided by Dr. Harald Huber, University of Regensburg, Germany. Thermotoga were cultivated at 77°C in SVO medium developed by van Ooteghem et al. . Fifty milliliters of SVO was dispensed into 100 ml serum bottles and sparged with nitrogen gas to remove oxygen from the medium and the headspace. Serum bottles were then sealed by rubber stoppers, secured by aluminum caps, and sterilized. Inoculation of the liquid SVO was done by a syringe needle with a typical inoculum of 2%. Liquid cultures were shaken at 100 rpm. For preparation of soft SVO, 0.075% Gelrite (Sigma-Aldrich Co., St. Louis, MO, USA) was dissolved in liquid SVO. Culture tubes with screw caps were filled with soft SVO up to two thirds of the volume capacity and were autoclaved. To grow Thermotoga on plates, double strength (2 ×) of liquid SVO and various concentrations of agar or Gelrite were autoclaved separately and then mixed with equal volumes while they were still hot. The medium either was directly poured to Petri dishes for standard spreading or streaking, or was mixed with cell cultures prior to pouring for embedded growth. A Vacu-Quik jar (Almore International Inc., Portland, OR, USA) containing a packet of 4 g of palladium catalyst was used for anaerobic cultivation of plates. The atmosphere inside of the jar was exchanged to 96:4 N2-H2 before it was placed into an incubator of 77°C. Colonies usually appear in 24 h and grow bigger in 48 h. Kanamycin was supplemented when needed at 150 μg ml-1 for liquid and 250 μg ml-1 for soft and solid cultures. Cell growth in liquid was monitored by measuring the optical density of cell cultures at 600 nm (OD600). All aforementioned operations were carried out on the bench top. One ml of overnight culture was mixed with 25 ml of hot SVO containing 0.3% Gelrite and poured into Petri dishes. Small discs of 7 mm in diameter were cut from Whatman qualitative filter paper and were placed on solidified plates. Various amount of kanamycin (50 ~ 250 μg) was added to the paper discs. After 48 h of anaerobic incubation, sensitive strains would display inhibition zones surrounding the discs. To specify the selective levels of the antibiotic in both liquid and solid media, kanamycin ranging from 50 to 300 μg ml-1 was supplemented, and the proliferation of bacteria was monitored for up to 72 h.
Plasmid DNA was extracted from Thermotoga using standard alkaline lysis method . For genomic DNA, overnight culture of Thermotoga was extracted with equal volume of phenol: chloroform: isoamyl alcohol (volume ratio 25:24:1) followed by centrifugation at 13,523 g for 5 min to remove cell debris. DNA in the supernatant was precipitated with equal volume of isopropanol, washed once with 70% ethanol, air-dried, and dissolved in 10 mM Tris-EDTA buffer (pH 8.0) containing 20 μg ml-1 RNase. Plasmid pKT1 carrying a thermostable kanamycin adenyl transferase gene (kan) was purchased from Biotools, B & M Labs (Madrid, Spain). Primers 5'-GGGGATCCGAATGTGGTTAGTGTGATTAG-3' and 5'-GGGAATTCTTAACCATATCCCACTAGTTC-3' were used to amplify pRQ7, which was linearized immediately after the stop codon of the replication protein as the result of the PCR reactions. The PCR product was digested by BamHI and EcoRI and was inserted into the corresponding sites of pUC19 to give rise to pDH1. The XbaI-EcoRI fragment of pDH1 was then joined to pKT1 pre-digested with the same enzymes to generate pDH10 [GenBank:JN813374] (Figure 1). The constructs were confirmed by both restriction digestions and PCR. Plasmid pDH10 carries ColE1 origin of replication (ori) and β-lactamase (Apr) for amplification and selection in E. coli, respectively. For its replication and selection in Thermotoga, pDH10 relies on the ori of pRQ7 and the engineered kan gene . The expression of the kan gene is driven by a promoter from Thermus thermophilus HB8 , which is expected to be active in Thermotoga as well, since the consensus sequences of Thermotoga  and Thermus  promoters are nearly identical. Genetic map of the shuttle vector pDH10. The region highlighted in bold represents the sequence of pRQ7. Enzymes with unique restriction sites are shown. Liposome-mediated transformation was conducted as previously described , except that all operations were carried out on the bench top. DOTAP liposomal reagent was purchased from Roche Diagnostics, Indianapolis, IN, USA. 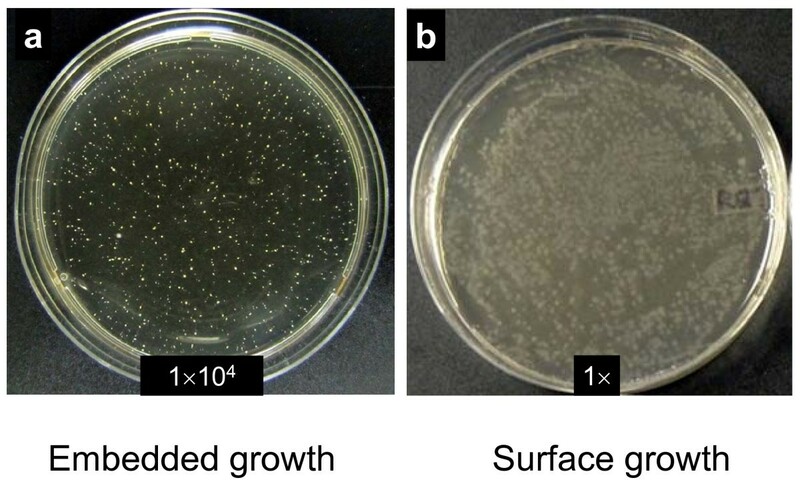 To prepare electrocompetent cells, overnight Thermotoga cultures were transferred to 50 ml of SVO liquid media and were allowed to grow until the cell density reached around 0.2. Cells were collected by centrifugation, washed once with cold deionized water and twice with the washing solution (10% glycerol, 0.85 M sucrose) and were resuspended in 500 μl of the same solution. For electroporation, 4 μg of plasmid DNA was mixed with 50 μl of the freshly made competent cells and incubated on ice for 5 minutes prior to introduction to a pre-chilled cuvette of 1 mm gap. The operation settings were 25 μF capacitance, 200 Ω resistance, and 1.5, 1.8, or 2 kV voltage (Gene Pulser Xcell™, Bio-Rad Laboratories, Hercules, CA). After electroporation, 1 ml of fresh SVO liquid medium was added to each cuvette, and the cell suspension was transferred to a N2 serum bottle and incubated at 77°C with gentle rotation for 3 h for recovery. Half of the recovered culture (500 μl) was then mixed with 25 ml of hot SVO solid medium supplemented with 250 μg ml-1 kanamycin, poured to Petri dishes, and incubated in an anaerobic jar to retrieve transformants. Cultures of Thermotoga recombinant strains were transferred every 12 h for 3 days with an inoculum of 2% to a fresh SVO liquid medium in the presence or absence of kanamycin. With each transfer, an aliquot of the cultures was withdrawn and diluted to 10-4. Ten microliters of each diluted sample was then mixed with 10 ml of hot SVO solid medium with or without the antibiotic and was poured into a four-section Petri dish. In order to facilitate comparisons, samples of the same strain (but with different treatments) were arranged to different sections of the same plate. After incubation in an anaerobic jar for 48 h, colonies formed in each section were counted and compared. To test the stability of pDH10 in E. coli, a liquid culture of DH5α/pDH10 was also transferred six times for every 12 h of growth in plain LB medium (no ampicillin) with 1% inoculum. Samples from each cycle were properly diluted and spread on plain LB plates to separate single colonies. One hundred such colonies were randomly chosen and were tested on LB plates containing 100 μg ml-1 ampicillin. For control purposes, strain DH5α/pKT1 was tested in parallel. The chance of obtaining Thermotoga transformants on plates can be seriously compromised if plating efficiencies are low. Considering that Thermotoga can tolerate brief exposures to oxygen, we simplified the overlay methods used by other groups (Kenneth Noll, University of Connecticut, private communication; ) and developed an embedded growth method. Properly diluted liquid cultures were suspended in hot SVO containing 0.3% Gelrite, and the mixtures were allowed to solidify in Petri dishes. In this method, cells were embedded in the medium matrix, and their exposure to oxygen was reduced. Ten microliters of an overnight culture of T. sp. RQ7 with a dilution factor of 104 formed 1256 colonies (Figure 2a), which equals to 1.26 × 109 colony forming units (CFU) per ml. By contrast, a surface culture, prepared by standard spreading in the same environment, would typically generate 7.56 × 103 CFU ml-1 (Figure 2b), about ten thousand times less. Given that T. neapolitana cultures contain approximate 3.0 × 109 cells after growing in liquid SVO for 14 h at 70°C , we estimate that the plating efficiency of our embedded method is close to 50%. This high efficiency enables us to select or screen a large number of single colonies while still enjoying the convenience of aerobic handling. Single colonies formed by T . sp. RQ7 cells. (a) Embedded growth. Cells were mixed with hot SVO medium containing 0.3% Gelrite and were poured to Petri dishes before solidification. (b) Surface growth. Cells were spread evenly on the surface of freshly-made SVO plates containing 0.3% Gelrite and 0.7% agar. The number on each plate indicates the dilution factor of each culture. To facilitate the transfer of single colonies from solid to liquid media under aerobic conditions, we introduced a soft SVO medium by adding 0.075% Gelrite to liquid SVO. Gelrite prevents atmospheric oxygen from penetrating deep into the medium. To transfer cultures from solid to soft SVO, single colonies were picked up from plates by a loop and were pushed down to the bottoms of the test tubes containing soft SVO, where a local anaerobic environment has been created. After 12-24 h of incubation, cultures grown in soft SVO were then transferred to liquid SVO by a syringe. Although the introduction of soft SVO seemed to prolong the overall operation cycle, it ensured maximum viability of Thermotoga cells during the transfer, which eventually allowed us to isolate Thermotoga transformants for the first time (see below). Soft SVO may also serve as an excellent storage medium for Thermotoga. Cultures kept at the bench top for 2 months were still vital and exhibited no growth defects. To determine whether kanamycin is a suitable selection marker for Thermotoga, one needs to know the sensitivity of Thermotoga host strains. An initial study indicates that T. maritima is sensitive to kanamycin , but a more recent work states that it is highly resistant to the antibiotic . For T. sp. RQ7, there are simply no related reports. We decided to clarify the discrepancy of the previous findings on T. maritima and to determine the sensitivity of T. sp. RQ7. Small discs of filter paper loaded with various amount of kanamycin were mounted on top of the SVO plates premixed with Thermotoga cultures (Figure 3a). After two days of incubation, cells not affected by the antibiotic grew into a dense lawn, forming a visible background. Sensitive cells in close proximity to the paper discs were unable to grow, resulting in clear halos. The inhibition zones formed on T. maritima plates (Figure 3a) revealed that this strain is indeed sensitive to kanamycin. A distinctive zone was visible even with the lowest concentration of kanamycin. T. sp. RQ7 displayed a similar level of sensitivity to the drug. As for T. neapolitana, slight inhibition was noticed when 100 μg of kanamycin was used, and a small inhibition zone was only apparent when 250 μg of the drug was used. Therefore, kanamycin may serve as a good selection marker for T. sp. RQ7 and T. maritima, but not for T. neapolitana. Sensitivity of Thermotoga spp. to kanamycin. (a) Sensitive cells formed inhibition zones surrounding the paper discs loaded with various amounts of the antibiotic, as indicated in the top left panel. Gas bubbles produced by the Thermotoga cells were clearly visible in each plate. (b) Optical densities of T. maritima liquid cultures grown with kanamycin ranging from 0 to 300 μg/ml. Results of three independent tests. Tm, T. maritima; Tn, T. neapolitana; RQ7, T. sp. RQ7. We next specified the selective levels of kanamycin in both liquid and solid media. The growth of T. maritima in liquid SVO was completely inhibited by 50 μg ml-1 kanamycin for at least 72 h (Figure 3b). However, spontaneous mutations sometimes caused the cultures to become resistant to the antibiotic, and a complete inhibition over a period of 72 h was only possible when the input amount was increased to 150 μg ml-1. Similar phenomena were also noticed with T. sp. RQ7. On SVO plates, spontaneous mutants of T. maritima and T. sp. RQ7 occasionally appeared after 48 h of incubation when up to 200 μg ml-1 kanamycin was added, but they rarely appeared when the antibiotic concentration was increased to 250 μg ml-1. Based on these observations, for the rest of the study, kanamycin was added at 150 μg ml-1 to liquid media and at 250 μg ml-1 to soft and solid media. Because most bacteria become competent after a short electric pulse, electroporation was attempted to introduce pDH10 to Thermotoga. Electric pulses of various strengths were applied to both T. sp. RQ7 and T. maritima in the presence of 4 μg of plasmid DNA, and the transformants were selected with embedded growth. When an electric pulse of 2.0 kV was employed, five T. sp. RQ7 and one T. maritima transformants were obtained. A pulse of 1.8 kV resulted in eight T. sp. RQ7 and no T. maritima transformants. When the voltage dropped to 1.5 kV, no transformants were available with either species. These results suggest that the optimal voltage for Thermotoga is around 1.8 to 2.0 kV. In the control experiment, T. sp. RQ7 and T. maritima cells were treated with a pulse of 1.8 kV in the absence of DNA, and no spontaneous mutants were found. All transformants (designated as RQ7/pDH10 or Tm/pDH10 hereafter) displayed visible growth after a 24 h incubation in soft SVO. Three RQ7/pDH10 strains (#5, #6, and #13) and the single Tm/pDH10 strain were propagated in liquid SVO for extraction of plasmid and genomic DNA. 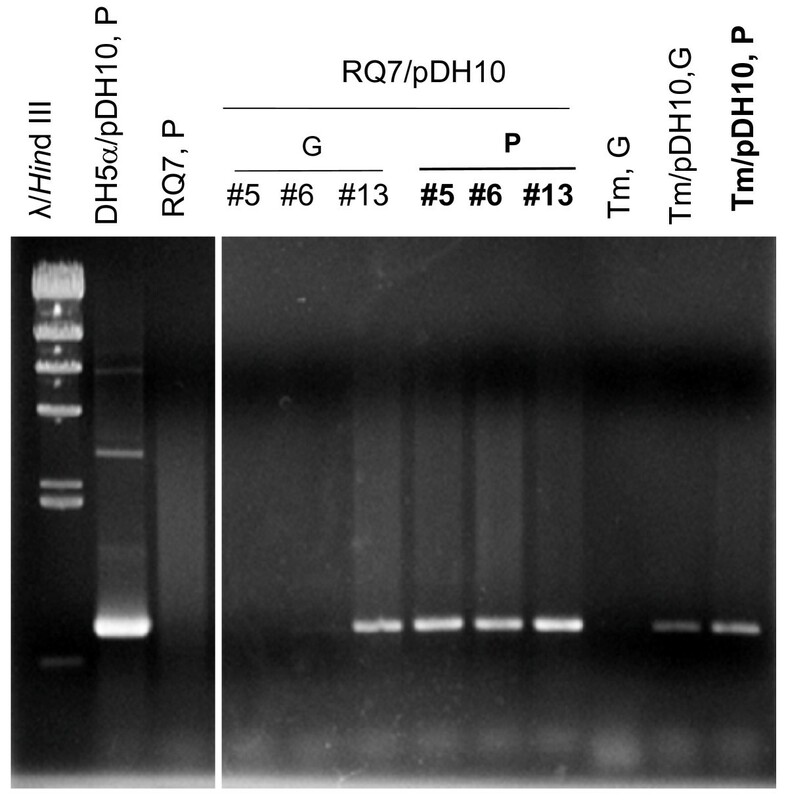 On agarose gels, no pDH10 DNA could be detected from the plasmid extract of any strain, even though pRQ7 was clearly visible from the three RQ7/pDH10 samples, indicating that the extraction procedure was successful. Plasmid and genomic DNA extracted from an equal amount of each transformant culture was then subject to PCR analysis. A fragment of 778 bp, corresponding to the size of the kan gene, was obtained from each plasmid extract (lanes are labeled in bold in Figure 4) but was missing from the genomic DNA of RQ7/pDH10 #5 and #6. 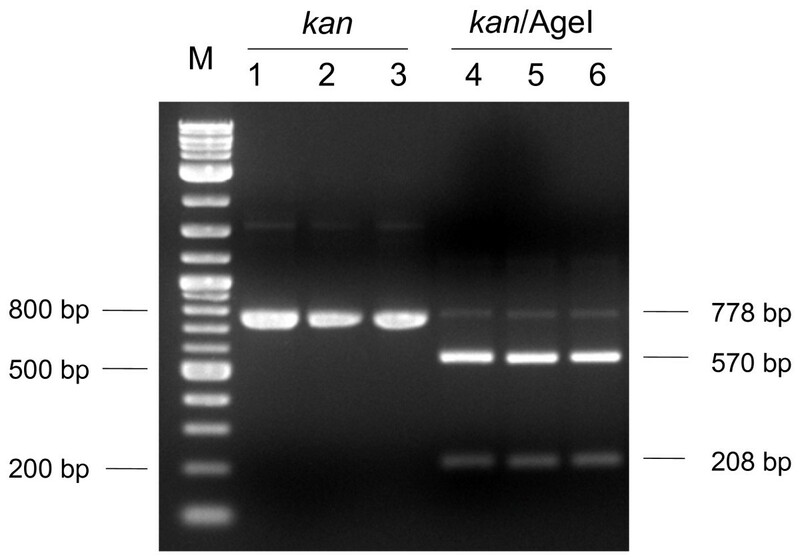 The PCR products were gel-purified and were subject to restriction digestion with AgeI, which is expected to cleave the kan gene into two fragments of 208 and 570 bp. Indeed, the digestion reactions released these expected fragments from every sample (Figure 5), indicating that the PCR products were authentic kan genes. Detection of the transformed kan gene. PCR products of the kan gene were obtained from the plasmid extracts (P, labeled in bold) or the genomic DNA preparations (G) of the recombinant strains. Three RQ7/pDH10 and one Tm/pDH10 transformants, all obtained by electroporation, were examined. Plasmid extracts from DH5α/pDH10 and T. sp. RQ7 were included as positive and negative controls, respectively. Analyzed with a 0.8% agarose gel. Restriction digestions of the kan gene. PCR products of the kan gene were prepared from the plasmid extracts of DH5a/pDH10 (lanes 1 and 4), RQ7/pDH10 (lanes 2 and 5), and Tm/pDH10 (lanes 3 and 6). Lanes 1-3 represent the PCR products of the kan gene, and lanes 4-6 are samples digested by AgeI. M, 2-log DNA ladder. Analyzed with a 2% agarose gel. For validation and comparison purposes, pDH10 was also introduced to T. sp. RQ7 and T. maritima through liposome-mediated transformation. Four T. sp. RQ7 and five T. maritima transformants were obtained from 1 μg of plasmid DNA, as opposed to zero colonies from the samples treated with liposomes containing no DNA. All transformants grew well in both soft and liquid selective media, and the presence of the kan gene was also confirmed by PCR. To determine the stability of the transformed DNA, liquid cultures of RQ7/pDH10 and Tm/pDH10 were transferred every 12 h, for six consecutive times, to fresh media in the presence or absence of kanamycin. Cultures from each transfer cycle were tested with both SVO (no kanamycin) and SVO+Kan plates. The number of colonies on a plain SVO plate represents the quantity of total viable cells in a sample, whereas the number from a SVO+Kan plate defines the abundance of resistant cells. Surprisingly, by the end of the experiment, ~100% of both RQ7/pDH10 and Tm/pDH10 still had the transformed DNA, even without the selective pressure (Table 2). The kan gene was confirmed by PCR from the plasmid preparations of all strains after each transfer. *Results of three independent tests. The stable maintenance of the transformed DNA in Thermotoga motivated us to test the stability of pDH10 in E. coli under non-selective conditions. The parent vector pKT1, a derivative of pUC19, was used as the control. Interestingly, pDH10 was much more stable in E. coli than pKT1 was. The parent vector pKT1 was eliminated by ~90% of the host cells after a single transfer and was completely lost from the population after three transfers (Table 3). By contrast, pDH10 was eliminated at a much slower rate. It was carried by ~90% of the cells after three transfers and ~32% of the cells after six transfers. Intact pDH10 was obtained from the resistant colonies. It is noteworthy to mention that similar results were also obtained when pDH1 and pUC19 were compared in the same way. These data demonstrate that the insertion of the pRQ7 sequence somehow enhances the stability of pUC family vectors. We next compared the copy numbers of pDH10 and pKT1 in their E. coli hosts. The two vectors were prepared from the same amount of cells and were digested by XbaI and EcoRI. These double digestions released the pRQ7 sequence from pDH10 (Figure 1 & 6). The abundances of the shared vector backbone of pDH10 and pKT1 were comparable on an agarose gel (indicated by the arrow in Figure 6), suggesting that the copy numbers of two vectors were similar. Therefore, the dramatically improved stability of pDH10 is not caused by an increase in copy number. *Results of four independent tests. 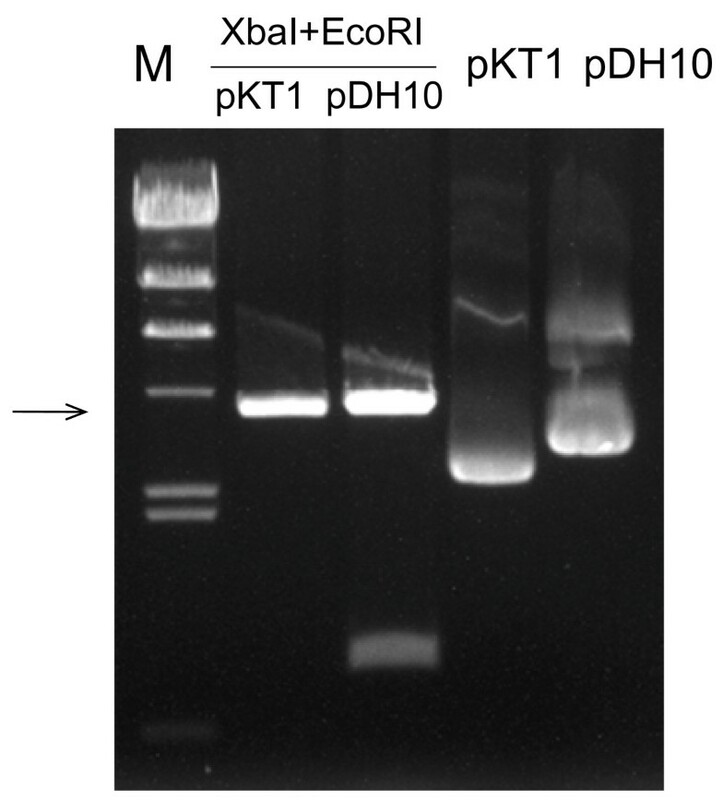 Comparison of the copy numbers of pDH10 and pKT1 in E. coli. Plasmid DNA was extracted from the same amount of recombinant cells and was digested by XbaI and EcoRI. The arrow indicates the shared sequence of the two vectors. Analyzed with a 0.8% agarose gel. The success of isolating transformants from solid media is essential to any genetic manipulation attempt. Whereas this is not a concern with aerobic mesophiles like E. coli, this requirement has become a limiting factor for the genetic investigations of many strict anaerobic, hyperthermophilic organisms. One obstacle is the requirement of an anaerobic glove box to handle plates. Since picking up colonies requires great precision, reaching out to a single colony with an inoculation loop or a toothpick through thick gloves has proven to be challenging for many of us. Even though gloveless chambers are commercially available, they are costly to maintain. Rolling tubes or tissue culture flasks in combination to Hungate techniques may serve as alternatives [16, 18–20], but they are prone to cross contaminations due to the narrow openings of these containers. Based on the fact that Thermotoga are fairly oxygen-tolerant, especially when they are not actively growing [1, 17, 21, 22], we prepare Thermotoga solid cultures with an embedded method, independent of an anaerobic chamber or an anoxic gas conduit. Our method sustains ~50% plating efficiency, making it possible to select for Thermotoga transformants among a sizeable population of viable cells. In addition, we developed a soft SVO medium to bridge the transfer of cultures from solid media to liquid media in an aerobic environment. Soft SVO is easy to make and convenient to use, and it also allows the withdrawal of cultures using a syringe. A heterologous kan gene has been functionally expressed and stably established in Thermotoga. The kan gene, carried on the shuttle vector pDH10, was introduced to Thermotoga by both electroporation and liposome-mediated transformation. The latter approach yields higher transformation efficiency (4~5 transformants per μg of DNA), but the former has the potential to mass-produce competent cells for future needs. Electrocompetency has been established in Thermotoga in this study, and a transformation efficiency of ~2 transformants per μg of DNA has been observed in RQ7 and ~0.25 in T. maritima. Two factors might have caused the transformation efficiencies to be low: the damages caused by oxygen and the activities of restriction-modification systems. Because the preparation of electrocompetent cells and the transformation procedure were performed under aerobic conditions, a significant portion of the Thermotoga cells would not survive the handling. Performing the experiment in an anaerobic chamber should help to improve the transformation efficiencies, albeit the operations would be cumbersome. In addition, restriction-modification systems have been discovered in Thermotoga, for instance, we have recently characterized a Thermotoga-specific Type II restriction-modification system . Unmethylated foreign DNA will be restricted by host-specific restriction nucleases as soon as they enter Thermotoga cells. Proper methylation of pDH10 prior to transformation is expected to significantly increase the quantity of transformants. Indeed, electrotransformation efficiency in Clostridia has been improved by 104~106 folds by methylating the shuttle vectors . Although intact plasmid DNA of pDH10 has not been detected in Thermotoga, we favor the idea that pDH10 is autonomous in Thermotoga, because the kan gene is always associated to a plasmid preparation instead of a genomic DNA extract (Figure 4). If pDH10 had been integrated into the chromosome, we would have seen the kan gene appearing more often from the genomic samples than from the plasmid extracts. Our data stated otherwise (Figure 4), suggesting that pDH10 is likely an independent molecule rather than part of the chromosome. Because genomic DNA can include both chromosomal and plasmid DNA, it is not surprising to occasionally obtain a positive signal from a genomic DNA sample, even though the kan gene is carried by a free-living plasmid. We suspect that pDH10 has an extremely low copy number in Thermotoga, because the attempts to detect it by inverse PCR (amplifying pDH10 outward from the kan gene), retransformation (transform E. coli with plasmid extracts of Thermotoga transformants), or Southern blotting (using digoxygenin-labeled probes made from either the kan gene or pRQ7) did not generate any signals. The expected inverse PCR product is ~4 kb, much bigger than the kan gene. This makes the inverse PCR technically more challenging than just amplifying the kan gene. In spite of the intriguing questions awaited to be answered with these elusive organisms, the door to the genetic manipulation of Thermotoga has been reopened. Ten years after the report of transient expression of heterologous genes in Thermotoga , we confirm that Thermotoga are truly transformable, not only by liposome-mediated transformation, but also by electroporation. Engineered Thermotoga strains are available for the first time. We are grateful to Dr. Harald Huber at University of Regensburg, Germany for providing T. sp. RQ7 and T. maritima MSB8 and to Dr. Kenneth Noll at University of Connecticut for sharing his lab protocol for cultivation of Thermotoga with the overlay method. This work was supported by BGSU internal funds to ZX. DH and ZX have one or more pending patent applications on the described technology. ZX conceived and coordinated the study and drafted the manuscript. ZX and DH designed the experiments and analyzed the data. DH carried out the experiments. SMN contributed to the stability study of pDH10 in E. coli. All authors read and approved the final manuscript.